Right guys, it’s salad time! After the EHEC/ecoli thread is finally over, Europe can let out a sigh of relief and devour raw vegetables again. Not that I ever stopped eating them. Here in Britain we were quite shielded from the whole outbreak – phew! Back at home in Luxembourg people were a bit more suspicious (or so I hear), so guys, it’s time to chuck out the soups and stews and celebrate the lovely “comeback” of salads! Sceptics, brace yourself: this salad is awesome! Super duper mega awesome! You could actually forget you’re munching on raw veggies – that’s how great it is! I fed it to my dear friend E. – or Agent Orange as I call her (hint: she calls me wasaaaaabi… YouTube video geeks will get the reference) – and she loved it. To put it into context (and make it more dramatic): E. was starving, totally grinding her teeth when she arrived at mine to do some evening editing work. So I whipped up this colourful salad (with a bit of a bad consciounce – come on, this girl was starving, and you don’t serve salad leaves to a starving friend). Anyway, I put it in front of her and she totally loved it – so much that she whipped out her iPhone and started putting pics of it onto Facebook. Nice one. Anyway, the magic of this salad lies all in the fact that it’s playing with textures, colours and degrees of temperature. First of all the onions are fried until they reach a state of translucent caramelized meltiness – lovely. Then, the quinoa is added whilst still lukewarm. Add some al dente broadbeans and edamame, some fresh lambs lettuce, tangy mint leaves and creamy goat’s cheese and sprinkle it all with toasted pine nuts (for some crrrrrrrunch). Then chuck over some great gremolata (vinaigrette) and dig in. Absolutely legen – wait for it – dary! Cook the broadbeans for 5 minutes (or until softening up). Drain and hold under some cold running water until they’ve cooled down. Now shell each little bean: cut a little opening into the skin with your fingernail, then gently push the tender flesh out – try not to squeeze it too much, so that it doesn’t come out as mush. The little broad beans should ‘pop’out. Cook the edamame beans for 5 minutes or until aldente. Drain and set aside. In a saucepan melt the butter and add the quinoa. Briefly fry. Add the chicken stock and cook until soft (you might need to add a bit more water). Dry-roast the pine nuts in a frying pan. Take off the heat, pour into a little bowl and set aside. Cut the onion in half and cut into slices. Heat the olive oil in a frying pan and fry the onions until translucent (about 5 mins), add the sugar and briefly caramelite. Set aside. Make the gremolata: finely chop the mint and basil. Add the lemon juice, icing sugar, olive and basil oil and season with salt, pepper and chili if you like to add some heat. 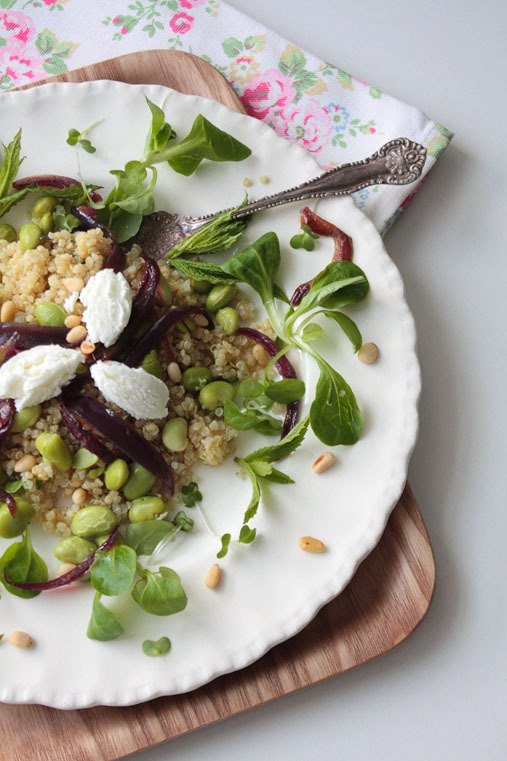 Set the plates: Put a few spoonfuls of quinoa into the middle of the plate, sprinkle with broadbeans and edamame. Put some of the onions on top, decorate with lambs lettuce and mint, sprinkle with pine nuts and cress. In the end crumble some goats cheese over it all (or make quenelles like I did), and splash generously with gremolata. Voila. Tip: To make this more substantial you can fry some pancetta until crispy and add to the salad – yum! Beautiful photos! 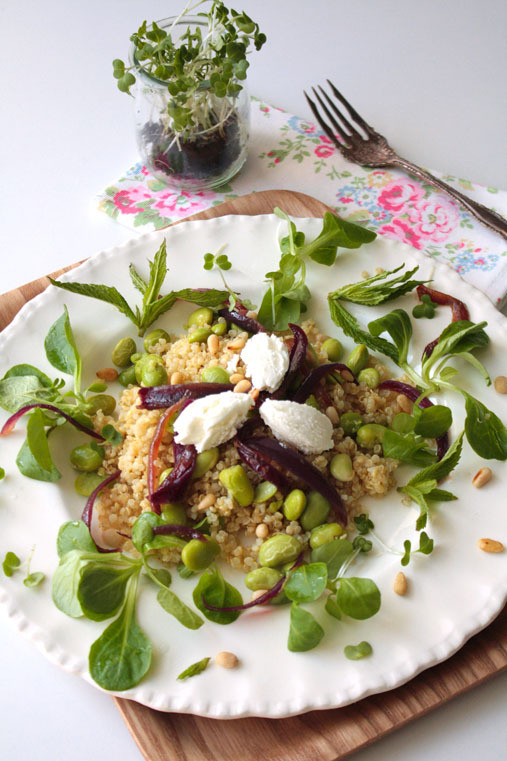 Lovely recipe for quinoa too – I always enjoy eating quinoa but don’t make it enough, this is the perfect inspirational recipe! Ah thank you 🙂 Hope you like the quiche!